It was fitting for a one-day series that has felt distinctly unloved that Michael Clarke was presented with his trophy in front of a near empty Ageas Bowl on a chilly September evening. For a few reasons this series, although played in front of near full-houses, has not felt as though it has captured the imagination. The weather, which ruined two matches, England's decision to rest five key players and the general fatigue that follows an intense Ashes campaign were all contributing factors. 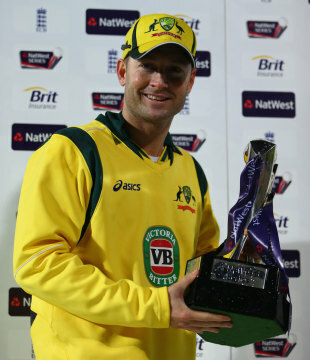 However, Michael Clarke was not going to allow such excuses to dampen his delight at claiming a trophy, their first in any format in England since winning the one-day series in 2009 by 6-1 margin. "For a lot of people this series doesn't mean a lot, but to this team it meant a great deal," he said. "We haven't performed as well as we would have liked as a one-day unit in the UK over the past couple of years and all the boys have worked exceptionally hard. It's a great reward for that hard work. Everyone in our changing room was extremely excited and so we should be, we deserve this win." Clarke was doubtful for the deciding match after another flare up of his chronic back problem, which has been a talking point throughout the tour. Although not moving entirely freely - and he admitted the back was "pretty sore" after the match - he contributed 75 in the series-defining stand of 163 with Shane Watson. "I certainly wouldn't have taken the field if I thought I was going to let the boys down," he said. "If I couldn't perform at my best I wouldn't have taken the field, but I certainly didn't want to miss this game. My back was certainly sore over the last few days and it's quite sore now, but we won so it was worth it. It was nice to contribute as well, I had the easy job standing at the other end to Watto - the way he played made my job a lot easier. It's a nice feeling to be sat here as winners of the series." For Watson, who became a figure of fun during the height of his lbw and DRS issues in the Tests, this was a pleasing way to conclude a tour where, barring a niggle at the tail-end of the Durham Test, he has been able to stay injury free. "It's always nice when you day turns out well," he said. "Everyone knew how important it was to win the one-day series. It's a really exciting time in Australian cricket to see how we are evolving." Clarke will now return to Australia - which may not feel like home after such a stretch overseas - but only for two weeks before, fitness permitting, he takes the one-day squad to India for a seven-match one-day series. That does not seem ideal ahead of another Ashes series, although care is being taken by the selectors not to repeat the mistakes of 2010-11 when a similar trip meant very little preparation time for the Tests, but Clarke sees this one-day team as an equally important element. "The India series is pretty important to is, we want to get back to No. 1," he said. "We need to get more consistent away from home and this series was a good start." Eoin Morgan, meanwhile, was left to reflect on England's self-inflicted damage in the first half of the run chase with the run outs of Kevin Pietersen and Luke Wright for ducks which undid an impressive final 20 overs with the ball. "At one stage, they looked like getting about 350," he said. So to restrict them to under 300 on a very good wicket, we felt it was a chaseable total. It was disappointing not to get closer, or even over the line. Two run-outs don't help. We lost wickets throughout the whole innings, didn't have a substantial innings from any individual or a big partnership."